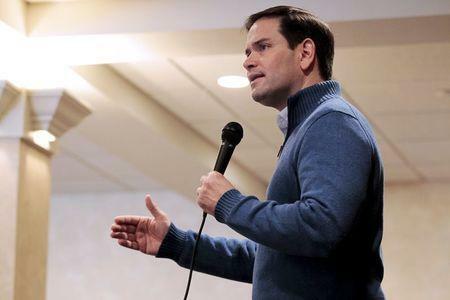 WASHINGTON (Reuters) - U.S. Republican presidential candidate Marco Rubio blamed North Korea's nuclear activities on President Barack Obama's "failed" foreign policy and called the Asian country's leader a lunatic. North Korea said it tested a miniaturized hydrogen nuclear device on Wednesday morning local time on orders from leader Kim Jong Un, claiming a significant advance in its strike capability. U.S. officials could not immediately confirm the test, which was reported late Tuesday on the U.S. East Coast. "If this test is confirmed, it will be just the latest example of the failed Obama-Clinton foreign policy," Rubio, a U.S. senator from Florida, said in a statement on Tuesday night. He was referring to Obama's former secretary of state, Democratic presidential front-runner Hillary Clinton. Republican candidates running for their party's 2016 presidential nomination have said Obama's foreign policy is weak, criticizing an agreement to contain Iran's nuclear program and the U.S. response to roiling crises in the Middle East, including the Syrian civil war. "I have been warning throughout this campaign that North Korea is run by a lunatic who has been expanding his nuclear arsenal while President Obama has stood idly by," Rubio said. Rubio said Obama should "stand up to people like Kim" but did not elaborate.